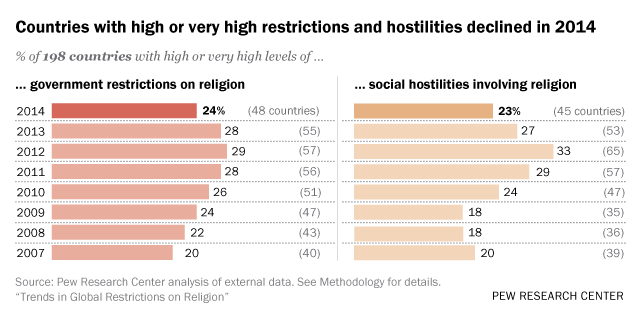 Pew Research Center has been tracking data on religious restrictions in nearly 200 countries and territories since 2007, producing a series of annual reports that analyze religion-related social hostilities and government restrictions on religion. 2 Religion-related terrorism spiked in 2014, with 82 countries experiencing this kind of danger, up from 73 countries in 2013 and 2012. These activities resulted in injury or death in 60 countries (up from 51 in 2013), reaching an eight-year high in lethality. The Middle East-North Africa region continued to have the highest share of countries with religion-related terrorism (90%) among the report’s five regions, although the Asia-Pacific region saw the biggest increase in the share of countries that experienced religion-related terrorism, rising from 36% in 2013 to 44% in 2014. 3The median level of social hostilities involving religion increased slightly in 2014 among the 20 countries in the Middle East and North Africa region (5.8 to 6.0), the tumultuous Middle East – where Christianity, Judaism and Islam originated – still stands out as the area of the world with the highest levels of social hostilities involving religion. Iraq was one of 10 countries in the region where social hostilities increased, due to violent acts by both Sunni- and Shia-dominated groups and militias, including the Islamic State. 4Certain religious groups stick out as particular targets of restrictions and hostilities. There has been a marked increase in the number of countries in which Jews were harassed. Jews, who make up just 0.2% of the world’s total population, were harassed either by governments or social groups in 81 countries in 2014, up from 77 in 2013, 71 in 2012 and 51 in 2007. 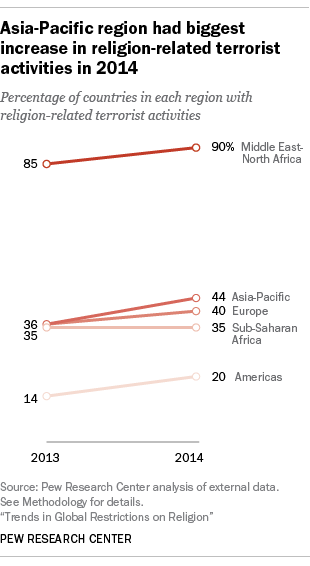 As in previous years, the world’s two largest religious groups faced harassment in the largest number of countries: Christians were harassed in 108 countries and Muslims in 100, up slightly from 102 and 99 respectively. 5Religion-related terrorism displaced over two million more people in 2014 than the previous year – a side effect of increased terrorist activity. Meanwhile, about 31.4 million people were displaced because of religion-related war or armed conflict – 4.1 million more people than in the previous year (27.3 million).